The story of the Jewish people is that of great destruction followed by miraculous redemption. That same resilient spirit is exemplified by your collective efforts to help this great city rebuild itself after Hurricane Katrina. Just as you have rallied time after time to help Israel weather the storms it has faced, you rallied to help New Orleans to get back on its feet. You should be proud of what you have been doing for the Jewish people and the Jewish state, and for others. I am doubly proud to be with you here today. Thank you. On the eve of the 20th century, Theodore Herzl, the founder of modern Zionism, foresaw the great challenges that stood before the dispersed Jewish people. He charted a clear path to direct the Jewish destiny to the safer shores of a Jewish state. Herzl's vision was guided by three principles: Recognize perils, seize opportunities, forge unity. These same three principles should guide us at the dawn of the 21st century. We must recognize the dangers facing us and work to thwart them. We must seize the opportunity for prosperity and for peace with those of our neighbors who want peace. And we must forge unity among our people to shoulder these monumental tasks. The greatest danger facing Israel and the world is the prospect of a nuclear-armed Iran. Iran threatens to annihilate Israel . It denies the Holocaust. It sponsors terror. It confronts America in Afghanistan and Iraq . It dominates Lebanon and Gaza . It establishes beachheads in Arabia and in Africa . It even spreads its influence into this hemisphere, into South America. Now, this is what Iran is doing without nuclear weapons. Imagine what it would do with them. Imagine the devastation that its terror proxies, Hizbullah and Hamas and others, would wreak under an Iranian nuclear umbrella. This is why Israel appreciates President Obama's successful efforts to have the UN Security Council adopt new sanctions against Iran. It values American efforts to successfully mobilize other countries to pass tough sanctions of their own. There is no doubt that these sanctions are putting strong economic pressures on the Iranian regime. But we have yet to see any signs that the tyrants of Tehran are reconsidering their pursuit of nuclear weapons. The only time that Iran suspended its nuclear program was for a brief period in 2003 when the regime believed it faced a credible threat of military action against it. And the simple paradox is this: if the international community, led by the United States , hopes to stop Iran 's nuclear program without resorting to military action, it will have to convince Iran that it is prepared to take such action. Containment will not work against Iran . It won't work with a brazen regime that accuses America of bombing its own cities on 9/11, openly calls for Israel 's annihilation, and is the world's leading sponsor of terrorism. When faced with such a regime, the only responsible policy is to prevent it from developing atomic bombs in the first place. The bottom line is this: Iran 's nuclear program must be stopped. Iran 's nuclear program is the greatest danger we face. The assault on Israel 's legitimacy is another. We know from our history that attacks on the Jews were often preceded by attempts to dehumanize the Jewish people - to paint them as vile criminals, as the scourge of humanity. This is why the attempts by our enemies and their misguided fellow travelers to delegitimize the Jewish state must be countered. Herzl was right about many things. He was right about the conflagration that would soon engulf Europe . He was right about the need for a Jewish state and for a Jewish army to defend that state. Yet Herzl was too optimistic in believing that the rebirth of the Jewish state would gradually put an end to anti-Semitism. The establishment of Israel did not end the hatred towards the Jews. It merely redirected it. The old hatred against the Jewish people is now focused against the Jewish state. If in the past Jews were demonized, singled out or denied the rights that were automatically granted to others, today in many quarters Israel is demonized, singled out and denied the rights automatically granted to other nations, first and foremost the right of self-defense. For too many, Israel is guilty until proven guilty. The greatest success of our detractors is when Jews start believing that too - we've seen that today. Last year, at the UN General Assembly, I spoke out against the travesty of the Goldstone Report, which falsely accused Israel of war crimes in Gaza two years ago. The United States , led by President Obama, and Canada , led by Prime Minister Stephen Harper, stood by Israel 's side against this blood libel. Many countries didn't. Well, last week, Hamas finally admitted that over 700 of its fighters in Gaza were killed by the IDF during that war. This is precisely what the Israeli army said all along - that roughly 50% of the casualties of the war were Hamas terrorists. Such a high percentage of enemy combatants and such a low percentage of unintended civilian casualties is remarkable in modern urban warfare. It is even more remarkable when fighting an enemy that deliberately and shamelessly embeds itself next to schools and inside mosques and hospitals. The authors of the Goldstone Report owe the Israeli army an apology. And all those who supported and helped spread this libel owe the State of Israel an apology. The best way to counter lies is with the truth. That is why I commend your decision to establish the Israel Action Network and dedicate resources to fight this battle for truth. We must fight these lies and slanders together to ensure that truth prevails. The threat from Iran and its proxies, and the continued assault on Israel 's legitimacy are great perils we must thwart. Now let me speak about two great opportunities we must seize: peace and prosperity. The opportunity today to achieve a broader Israeli-Arab peace derives not exclusively but mainly from the perception of a common threat. Today, Arab governments and many throughout the Arab world understand that Iran is a great danger to them as well. This understanding opens up new possibilities for a broader peace that could support our efforts to reach peace with our Palestinian neighbors. Israelis want to see that the Palestinians are as committed as they are to ending the conflict once and for all. They want to know that just as we are ready to recognize a state for the Palestinian people, the Palestinians are ready to recognize Israel as the state for the Jewish people. Israel also wants a secure peace. We do not want to vacate more territory only to see Iran walk in and fire thousands of rockets at our cities. That is exactly what happened after we left Lebanon and Gaza . We don't want to see rockets and missiles streaming into a Palestinian state and placed on the hills above Tel Aviv and the hills encircling Jerusalem . If Israel does not maintain a credible security presence in the Jordan Valley for the foreseeable future, this is exactly what will happen. I will not let that happen. We do not want security on paper. We want security on the ground. Real security. I am willing to make mutual compromises for a genuine peace with the Palestinians, but I will not gamble with the security of the Jewish state. Palestinian leaders who say they want to live peacefully alongside Israel should sit down and negotiate peace with Israel . They should stop placing preconditions and start negotiating peace. The Palestinians may think they can avoid negotiations. They may think that the world will dictate Palestinian demands to Israel . I firmly believe that will not happen because I am confident that friends of Israel , led by the United States , will not let that happen. There is only one path to peace - that is through a negotiated settlement. We should spend the next year trying to reach an historic agreement for peace and not waste time arguing about marginal issues that will not affect the final peace map in any way. I am confident that if there is goodwill on the Palestinian side, a formula can be found that will enable peace talks to continue. I believe that if we succeed, and I always like to confound the skeptics, and I continue to do that systematically, I believe that peace would unleash tremendous economic opportunities for Israelis, Palestinians, and peoples throughout the region. But as the last years have shown, Israel has not waited for peace to seize the opportunity to develop a strong economy. As Prime Minister, then as finance minister and now again as Prime Minister, I have spent a great deal of time advancing economic reforms and removing obstacles to Israel's economic growth - and I have the political scars to prove it. The reforms that we have been enacting have changed Israel 's economy beyond recognition. We are now building fast roads and rail lines that crisscross the country, to connect the Negev and the Galilee to the center of the country. I intend to complete a rail line that will link the Red Sea with the Mediterranean and the Jordan River to the Port of Haifa . This will enable Israel to take advantage of its strategic location as more and more goods are shipped from East to West. As the world economy becomes more competitive, Israel is well placed to succeed. We are global leaders in high technology. Our scientists win Nobel Prizes. Our innovations in science, medicine, water, energy, communication, agriculture and in many other fields are literally changing the world. Israel is a wellspring of technological, artistic and cultural creativity. Today, Israel is ranked 15th in the world in terms of quality of life - by the UN - so you knows we are at least 15th. And if that does not impress the young people in the audience, here's something else that might. For those of you planning to travel world, Lonely Planet just ranked Tel Aviv the 3rd most exciting city in the world. I don't agree - that of course is Jerusalem . Still, Israel 's best economic days are ahead. If we hope to thwart and dangers and seize opportunities, we must strengthen our unity. The best way to strengthen Jewish unity is to strengthen Jewish identity. By deepening our connection to our shared past, we fortify our bonds to one another and to our state, and thereby strengthen our common future. That is why this year I decided to initiate a national Heritage Plan that will restore and renovate hundreds of Jewish and Israeli sites throughout the country. I want young people to visit the place where David Ben Gurion declared our independence just as I want them to visit the place where our patriarchs and matriarchs, the mothers and fathers of the Jewish nation, are buried. Talk about distortions, can you imagine that UNESCO tried to deny the Jewish connection to Rachel's Tomb next to Jerusalem and the Tomb of the Patriarchs in Hebron? This absurdity to try to erase our past will fail as we reconnect a new generation of Jews with their history. Our young people will know that we are not foreign interlopers in our own homeland. They will know something that our enemies and politicized international bodies cannot bring themselves to admit: The Jewish people are not strangers in the Land of Israel . Israel is our home. It has always been our home and it will always be our home. I have also decided to enhance Israel 's support for programs that strengthen Jewish identity in the Diaspora. In my first term as Prime Minister, I decided to invest Israeli government funds in what many then thought was a preposterous idea - that we would pay for young Jews to come on short visits to Israel . Since then, a quarter of a million Jews have come to Israel on Birthright programs, and we will continue. I am committed to working with Birthright, Masa and Lapid to ensure that every young Jew who wants to can come to Israel . And I am committed to working with Natan Sharansky and the Jewish Agency to strengthen Jewish identity in the Diaspora. I know that there are controversial issues that threaten to divide us. We need to resolve these issues in a spirit of compromise and tolerance. 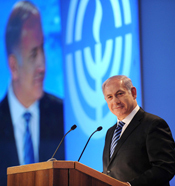 As Prime Minister of Israel, I promise you that I will not permit anything to undermine the unity of our people. Israel must always be a place that each and every one of you can call home. Our unity is a critical foundation of our collective strength. The more we speak with one voice, the more that voice will be heard. And in a rapidly changing world, it needs to be heard loud and clear. At the beginning of the 21st century, the fantastic rise of Asia challenges many nations, but it is not a danger. It is a natural shift in global wealth and power that is lifting hundreds of millions of people out of poverty. The great danger we face is not from the battle between East and West but from the aggressive force wedged between them that is spreading its tentacles far and wide. That force is radical Islam, whose fanaticism and savagery knows no bounds. If I can leave you with one message, it is that we must warn others of this peril. History shows that the most advance weapons were usually developed by the most advanced societies. Yet today, primitive and barbaric tyrannies that stone women, hang gays, promote terror worldwide, send bombs to synagogues, and advance the most fanatical doctrines can acquire nuclear weapons. If not stopped, this means that the greatest nightmare of all - nuclear terrorism - can become a reality. The civilized world must not let that happen. As we continue to build a modern and democratic Israel and as we seek peace with all our neighbors, we must also warn the world about this formidable peril. In standing up for modernity against medievalism, the Jewish people and the Jewish state play a vital role in securing our common civilization. And by helping dispel the shadows of a dark despotism, we can truly fulfill our destiny to be a beacon of light and progress unto all the nations.